When I was a child, to go and visit the castle of Trévarez with my family at Christmas time was almost a tradition. Like many families from Finistère, the region I come from, we used to go there and marvel at the display of nativity scenes from around the globe. Years later here I am, back in my home town, wandering in the alleys of the castle estate in this festive time. 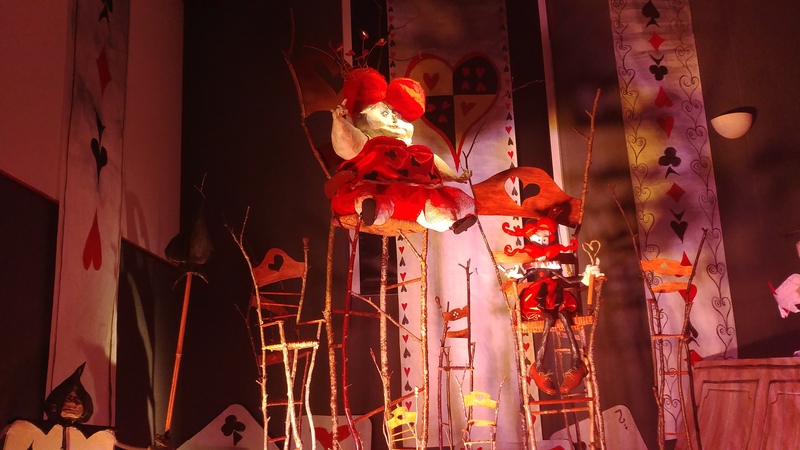 This time, nativity scenes are gone, replaced by a setting just as wonderful : Alice in Wonderland. Indeed, according to the owner of the land, recent discoveries revealed that the little girl often spent her vacations here. Really? You are not convinced ? Well, I’m sure you’re not the only ones. To open the mind of the skeptics, let’s invite them to this temporary exhibition, from November 25th 2017 to January 7th 2018, about her and her story. I was delighted to spend time again in the world created by Lewis Caroll. For this occasion, the estate’s stables are transformed into the Wonderland itself, and this is really well done. The displays are beautifully crafted and the exhibit can suit for children and adults all together. We rediscovered throughout the scenes the story of Alice and all her compagnons. The mystic caterpillar, the evil queen, the ever-late white rabbit, the mischievous cheshire cat…. This year all those crazy characters from the tale are reunited in the stables, surrounded by a background spotted with playing card patterns. It is almost as you can feel the queen of heart madness lurking around the corner. If you lose your way, feel free to ask directions to the Cheshire Cat! As we are leaving Wonderland, we can feel the air got cooler. It is the perfect time to sip a hot mulled wine and eat a Christmas tree-shaped waffle while waiting for nightfall in order to admire the illuminations. All this got us in Christmas mood and warmed us a bit. We are now heading toward the castle. It is very cold, but this night walk is still very enjoyable thanks to the fun lights along the path. Many clocks and wrist-watches draw us back to the Alice in Wonderland Theme, and the white rabbit race against time. As for the castle, it hides its usual red bricks under a cloak of light projections. At 6pm the castle is lit. Inside, we visit the permanent exhibition “Build a dream” relating the castle’s history, which was completed in 1907 and famous for its modernity at the time. Unfortunately we can only visit parts of it, which are not in perfect condition. The ceiling is missing or damaged after several bombings during WWII. Bit by bit the castle is being renovated since it has been acquired by the state and opened to the public in the 70’s. The furniture on the ground floor let us a sneak peak at the daily life in the early 20th century. A time when we read one of the many books from your private library while waiting for a copious meal to be served at the table near the massive fireplace. James de Kerjégu, owner of the land at the time, probably never though that only decades later we would be in his living room, taking pictures with our smartphones. There are parking spots for people with reduced mobility. There is an access ramp at the entrance, and others to access the castle and the food area. Christmas temporary exhibits are also equipped with ramps. The long path going from the stables to the castle is uphill. For manual wheelchair users you will need some help to reach the top. The surroundings of the castle are made of gravels, so you might need some help here also where gravels are too deep. There is a special rate for handicap people and caregivers, which is 1€ each instead of the standard price of 7€. Plus, the price is 4€ for 18 to 25 yo, 1€ for 7 to 17 yo, and it’s free for the ones under 7. According to the estate website, a wheelchair is available upon request at the front desk, and there are folding cane-seats freely available. There is wheelchair friendly restrooms on the castle ground floor and in the coffee place next to the stables.